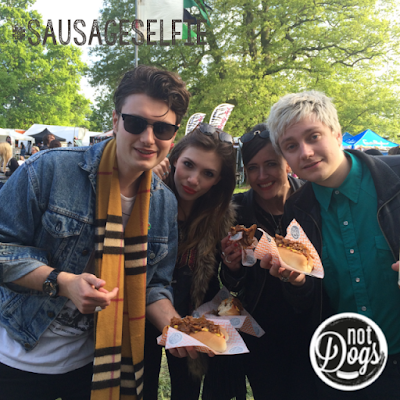 Birmingham - Win Free Not Dogs for Life to celebrate Not Dogs Being at Fusion Festival! 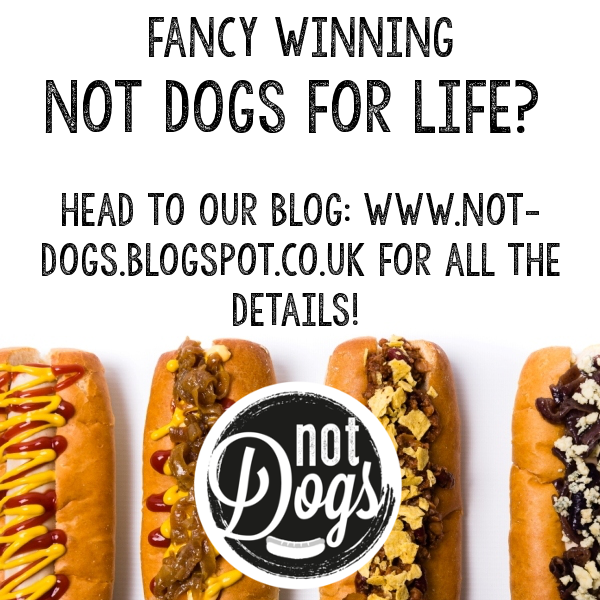 The competition closes at 6pm on Thursday 27th August 2015 and after that time we'll announce the lucky winners who can come and collect their exclusive Not Dogs for Life card at Fusion Festival, Birmingham! The Weston Park competition will run from Tuesday 25 August 2015 until 18.00 on Thursday 27 August 2015. 1 x winner from Instagram and 1 x winner from Twitter will be selected at random from all valid entries and will be announced on Thursday 27 August 2015. The decision is final and no correspondence will be entered into. Winners will be required to collect their Not Dogs for Life card from the Not Dogs food truck at Fusion Festival, Birmingham. If this isn't possible, the cards will be sent out in the post (provided the winners have given correct postal addresses) in September 2015. Voucher must be used in conjunction with valid form of ID to claim a free Not Dog. The voucher will not be accepted if used by anyone other than the winner. The winner may claim one free Not Dog per day from Friday 28 August 2015 and for the rest of his/her life when claimed with a valid form of ID and approved by Not Dogs. 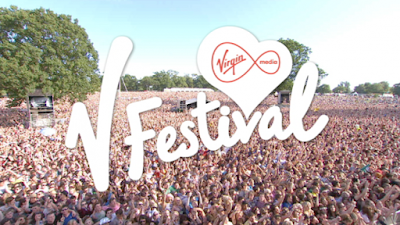 V Festival, Weston Park - Win Free Not Dogs for Life to celebrate Not Dogs Being at V Festival! 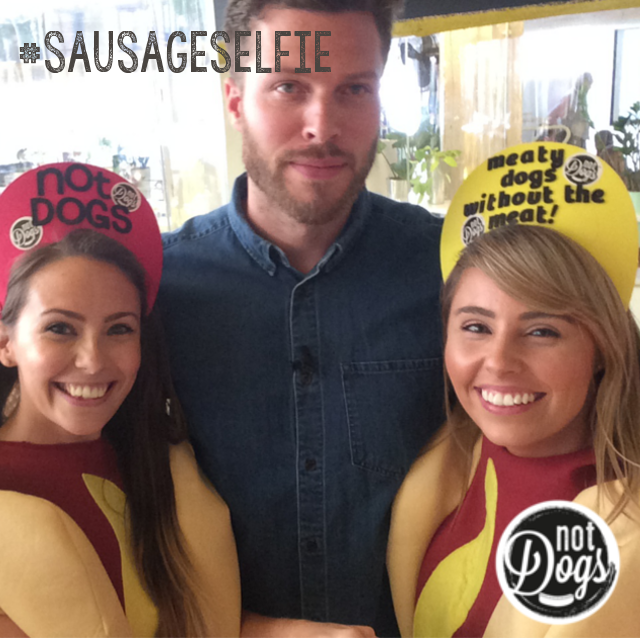 The competition closes at 6pm on Thursday 20th August 2015 and after that time we'll announce the lucky winners who can come and collect their exclusive Not Dogs for Life card at V Festival, Weston Park! The Weston Park competition will run from Monday 17 August 2015 until 18.00 on Thursday 20 August 2015. 1 x winner from Instagram and 1 x winner from Twitter will be selected at random from all valid entries and will be announced on Thursday 20 August 2015. The decision is final and no correspondence will be entered into. Winners will be required to collect their Not Dogs for Life card from the Not Dogs food truck at V Festival, Weston Park. If this isn't possible, the cards will be sent out in the post (provided the winners have given correct postal addresses) in September 2015. Voucher must be used in conjunction with valid form of ID to claim a free Not Dog. The voucher will not be accepted if used by anyone other than the winner. 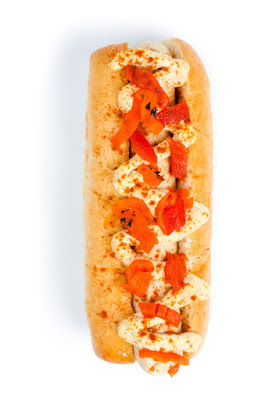 The winner may claim one free Not Dog per day from Friday 21 August 2015 and for the rest of his/her life when claimed with a valid form of ID and approved by Not Dogs. Although we didn't have any friends or family members relating to the letter H, Hello Houmous is very close to our hearts! 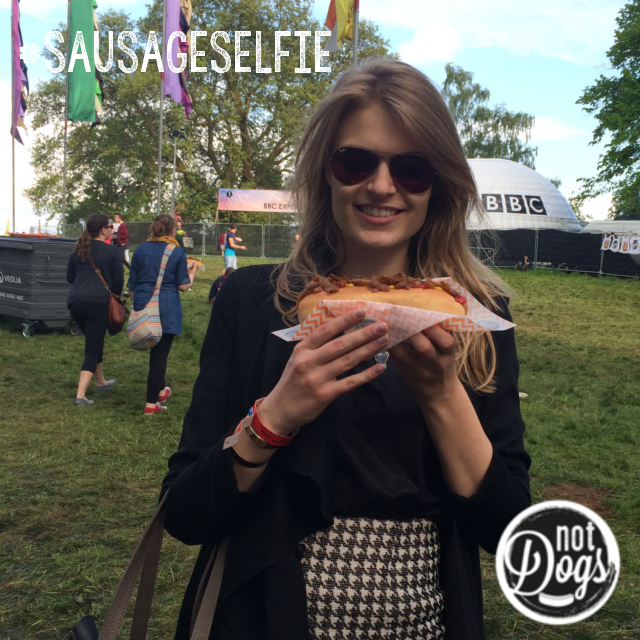 Hello Houmous is actually one of co-founders Katie & Jane's favourite Not Dogs which is quite surprising as who would have thought houmous and 'hotdogs' would go together so well!? Usual paprika just wouldn't do so we went for a delicious smoky taste to go on top of the vibrant red peppers... a match made in heaven! We love to get some famous faces involved with Not Dogs - it's great to meet people at festivals and out-and-about who love Not Dogs and can help spread the 'meaty dogs without the meat' word to the masses! 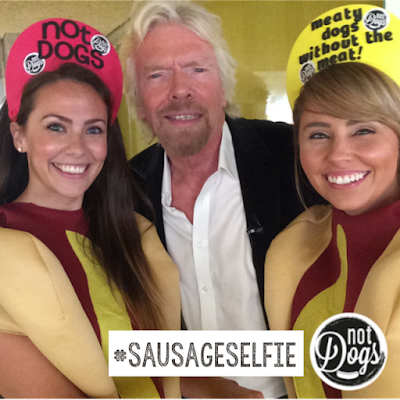 Last month we attended the Virgin Media Pitch to Rich event in London (read all about it here) and having got changed into our custom Not Dogs outfits at Euston (very glamorous!) 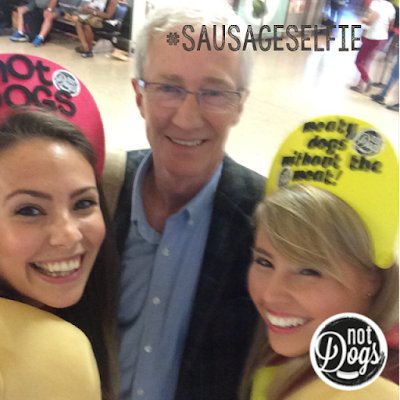 the first person we managed to get a #SausageSelfie with was none other than dog lover Paul O'Grady! Here's some other famous #SausageSelfie pictures that we've managed to capture during our travels in 2015 so far... which is your favourite! ?